​BIBLE READING—WEEK 34—JEREMIAH 30-50: Last week’s Short Report looked at how God shaped both Jeremiah and the historical events of his time with the particular purpose of proclaiming God’s judgment on His Covenant People for their years of unrepentant rebellion, yet he also give them God’s hope for the future. This past week’s reading brought us through Jeremiah 50, and this week’s Short Report will focus on the fall of Jerusalem, and a few other choice verses. Following the report is a small chart that attempts to put the many chapters, which at times seem to appear at random, in chronological sequence. 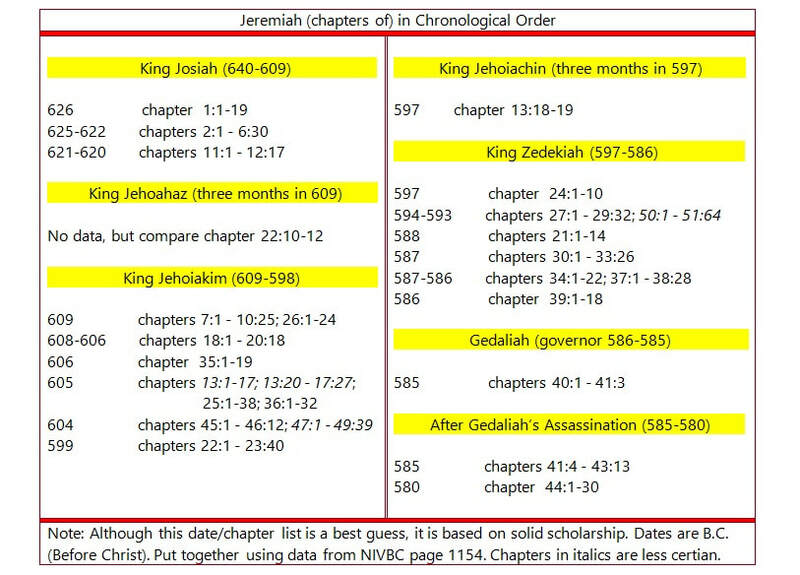 In his introduction to the People’s Bible Commentary (PBC) David M Gosdeck’s timeline shows that in 597 B.C. Nebuchadnezzar placed Zedekiah on the throne in Jerusalem. This coincides with Ezekiel being exiled. About 11 years later “Babylonian forces completely destroy Jerusalem” from 587 to 586 B.C. and in the end took Zedekiah to Babylon (p. 7). In chapter 21 the siege for the Promised Land had already begun when a young Zedekiah sent representatives to Jeremiah to discover the Lord’s will regarding Babylon’s attack on the Kingdom of Judah; his hope was that God would intervene and save the remainder of Israel, but Judah’s fate had already been sealed to defeat. The Lord’s answer was to surrender so they would live. This is reinforced in Chapter 24 with the vision of the fig baskets where God explains to Jeremiah that the good figs symbolize the people of Judah that go into exile. Then God says, “I will set my eyes on them for good, and I will bring them back to this land” (v. 6). But the bad figs, those people of Israel that remain in Jerusalem and Egypt, would be “utterly destroyed” (v. 10). Over the centuries God called His people to be obedient and faithful; Deuteronomy 27:10 says, “You shall therefore obey the voice of the Lord your God, keeping his commandments and his statutes, which I command you today.” This subject is repeated in verses like Joshua 24:14, 1 Kings 8:61, and 2 Chronicles 7:14. Israel had some good leaders and people, but in the final analysis Israel’s rebellion broke their covenant with God—they were a stiff-necked people—stubborn and rebellious (cf. Exodus 32:9). The Southern Kingdom’s fate was sealed, but King Zedekiah, the officials of Judah, and many of the common people would not listen to God, nor surrender to His leadership. Rather than hear the words of the Lord as spoken by His prophet Jeremiah, who first provided a way back to God (e.g. Jeremiah 7:4-7; 11:1-5) and then a route to at least save their lives by accepting their fate, they rebelled and threatened to take Jeremiah’s life (chapters 26 and 38). In chapters 29-33 God keeps faith with His people even as some have already been deported and while the Babylonians hold the land and build seize ramps to force entry into their fortified cities. Last week we saw Jeremiah’s letter to the first exiles and recall the words, “For I know the plans I have for you, declares the Lord, plans to prosper you and not to harm you, plans to give you hope and a future” (29:11, NIV-84). That future of restoration is on display in the four chapters that follow. Speaking about Jeremiah 30:9, and to all of the promises of God, Gosdeck tells his readers, “At the center of the promise, at its very heart, stands David their king. … Now King David had been dead for four centuries. But one greater than David was coming, David’s greater Son, Jesus Christ. Jeremiah pointed to him because in him and upon him all the promises of God rest and are secured.” Gosdeck mentions Corinthians 1:18-20 as supporting Scripture and adds how Jeremiah shows us our Savior “directly and clearly” (p. 190). In chapter 31 God reminds Israel of His great love and promises a New Covenant. As discussed last week, for God, covenant language is also courtship language. We can see those elements here where God says, “"I will be the God of all the clans of Israel, and they shall be my people” (v. 1). "I have loved you with an everlasting love; therefore I have continued my faithfulness to you" (v. 3). “Return, O virgin Israel, return to these your cities” (v. 21). “I will make a new covenant with the house of Israel and the house of Judah, not like the covenant that I made with their fathers on the day when I took them by the hand to bring them out of the land of Egypt, my covenant that they broke, though I was their husband, declares the Lord” (vv. 31-32). There are also a few verses that bring the 23rd Psalm to mind: “I will make them walk by brooks of water, in a straight path in which they shall not stumble" (v. 9). "[I] will keep him as a shepherd keeps his flock" (v. 10). "For I will satisfy the weary soul, and every languishing soul I will replenish” (v. 24). That Judah and Jerusalem are about to fall into the hands of the Chaldeans is brought into full view with the opening verse, “The tenth year of Zedekiah king of Judah, which was the eighteenth year of Nebuchadnezzar.” That means it is now 587 B.C., and about halfway through the third and final siege on Jerusalem. In the PBC Gosdeck explains the situation this way, “The Babylonians had had the city under siege for about a year and a half. Except for a couple of other powerful fortresses and Jerusalem, all the cities of Judah had surrendered to Nebuchadnezzar” (p. 211). Turning to the subject of Jeremiah buying land as a kinsman redeemer Gosdeck says under the circumstances such a purchase would seem to be “completely foolish.” But redeeming the land “was a visible pledge by the Lord, an advance on his promise of restoration” (pp. 211-212). And the NIVBC says, “Jeremiah knew that the Lord was behind the offer. He had not doubted the Lord’s word and had its confirmation in vv. 6-7. Now he realized all the meaning of the purchase in relation to the nation’s future” (Barker, 1229). One of the themes in chapter 33, the Righteous Branch of David, is first mentioned in chapter 23 and is another reminder of God’s plans to give Israel hope and a future. In his Bible handbook Henry Halley says, “Here, in chapter 33, he repeats with fuller explanation, the prophecy of ONE GREAT KING, called ‘The Branch,’ in whom the promise would be fulfilled” (p. 316). In chapter 38, because Jeremiah continues his message—surrender to Babylon and save your life—the officials plot to remove him and have him thrown into a muddy cistern, there he would die a slow death, but in what could have been a last glimmer of hope Zedekiah commands that the prophet be rescued (v. 10) and be kept safe (v. 16). Once again Zedekiah questioned Jeremiah and was again given reassurance of his safety. Sadly, Zedekiah, who swore an oath to spare Jeremiah’s live in verse 16, could not come to terms with a similar promise that God would deliver him from the Babylonians. Taking account of Zedekiah’s conversation with Jeremiah the Eerdmans Bible Commentary says, “He could not implement into action what his own mind acknowledged as wise and sound. … It was Zedekiah’s indecision and lack of courage that actually brought about the ghastly result” (Guthrie, 649). In the 39th chapter of the book of Jeremiah the walls of Jerusalem are breached and “all the officials of the king of Babylon came and sat in the middle gate” (v. 3). At this point, Gosdeck tells his readers, “Nebuchadnezzar was not present at the final breakthrough.” He was some 200 miles to the north where he both conducted the affairs of his empire and kept an over watch on his war machine in Judah. One of his “commanders was Nergal-Sharezer of Samgar, his son-in-law” (254). I could not find any material that explained the Middle Gate. There are various theories that attempt to identify it. Gosdeck suggests that is “probably the Valley Gate, located between the old and the new parts of the city” (254). Seeing the situation, Zedekiah and his soldiers ran for their lives by way of the king’s garden toward the Arabah, which the Eerdmans Bible Dictionary describes as an area near the Jordan Valley (Myers, 69). The Babylonian army gave chase and overtook them near Jericho and delivered Zedekiah to Nebuchadnezzar's Head Quarters, “and he passed sentence on him” (v. 5). Zedekiah was forced to watched his sons being slaughtered. The officials of Judah were also slaughtered. Then Zedekiah was rendered blind and lead off to Babylon in chains. In verse 8 we are told, “The Chaldeans burned the king's house and the house of the people, and broke down the walls of Jerusalem." In conclusion, this weeks Short Report focused on the fall of Jerusalem and the many chances God gave the City, and all of the Israelites, not just during this historic event but throughout their covenant relationship to be obedient and faithful. We have seen in Jeremiah a type of suffering servant that called God's chosen people to return to God, but failing that to surrender to the Babylonians, so to spare their lives, with a promise to that God would return them to the Promised Land. Gosdeck, David M., Jeremiah/Lamentations - People’s Bible Commentary. Concordia Publishing House, 1995. Guthrie, D., Eerdmans Bible Commentary, The. William B. Eerdmans Publishing Company, 1970. Note: this is no longer in print.